Our clients can avail from us a quality approved array of Jack Hammer. The Jack Hammer we offer is widely demanded amongst the clients for its durability and reliability. Besides, these products are available in the market at reasonable rates. With the proficiency in this field, we are proficient in presenting an extensive assortment of Pneumatic Jack Hammer. We are one of the leading manufacturer for Jack Hammers, which are used in mining industry. These are manufactured using quality high alloy steel. Vijay Sai Mining Equipment Pvt. Ltd.
Haryrock Jack Hammer, Air Inlet Size (NPT): 3/4"
Air Inlet Size (NPT): 3/4"
Relying on our expertise in this domain, we are into offering Jack Hammer. The DKR 36 is a dual function pneumatic drill/chipper that weights just for kilos. It is a machine that packs a powerful punch. Despite its light weight and compact size, you can get more work done - Up to two to three times more - Than with a comparable electric drill. It's a lot more robust, and will not burn out when pushed hard. With the advent of modern tools and advanced methods, we execute world-class collection of Jack Hammer that are sturdy in construction and have high strength. We bring them with varied thickness and are easy to operate. Our entire product range has high speed percussion and is used to efficiently break hard stones and rocks. 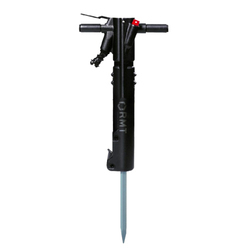 Jack Hammer, air flushed medium heavy duty rock drill is used for a variety of surface drilling applications in quarries and construction sites. It is capable of drilling 27- 40 mm diameter holes with H 22 Integral and extension steels up to a depth of 6 M. JMT model JMT 041 is a powerful Rock Drill with proven performance. We are offering Jack Hammer.